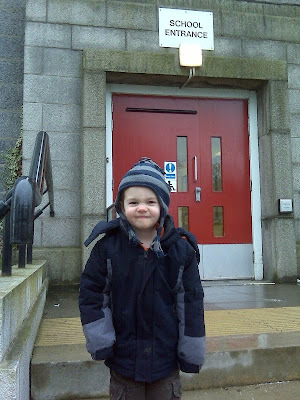 Yesterday was Joshua's first day of school in Aberdeen. We waited a little while after we settled in here before signing him up for school. We wanted him to have time to adjust to the move and his new home. He is so excited to be back in the classroom. Leaving Miss Bela's class in Princeton was the hardest thing for him in this move. We went for a tour and to sign up before the new year, hoping he could start right after the holidays, but they had a waiting list and told us that they were expecting an opening in February. I received a call last week asking if we were still interested, and he started a week later. 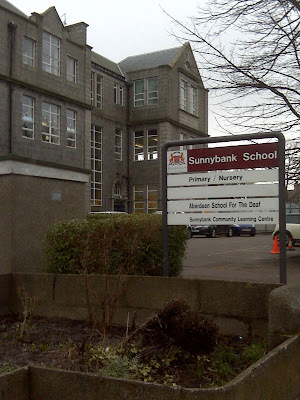 This is Joshua's school. It is the local primary (elementary) school in the public school system. They provide nursery school (preschool) for three and four year old's in their public schools here (as space is available, as we learned from the two month wait). It is not mandatory at this age, but it is free (i.e. paid for by tax dollars). We were wonderfully surprised on the first day when we walked in to class ... Joshua was assigned to the same class as Rebekah, our American neighbor. They were both excited to see each other and, of coarse Emily and I were thrilled. Both our little kids are OWLS! (they name all their classes by animal). It seems to be a great class, and Joshua has loved every minute of it. They like to start the kids slowly, so they have time to adjust to the new environment and schedule. On Thursday, his first day, he was only in class for about 45 minutes. Today he spent an hour in class. On Monday he will come in at the start of class, but I will pick him up about 45 minutes early. But on Tuesday he is thrilled to know that he will be starting at 12:45pm with all the rest of the children and not leaving until 15:15 (3:15pm) when all the other children leave. He can hardly wait to spend the entire session in his new class. Congratulations, Joshua! My little boy is growing up! So glad Joshua is enjoying school! I know he and Rebekah will love being in the same class. So sweet! Joshua looks so happy in that picture!